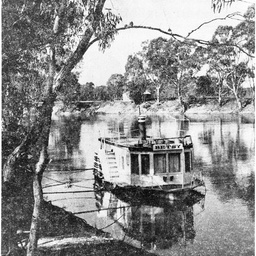 The 'Avoca' paddle steamer on the river. 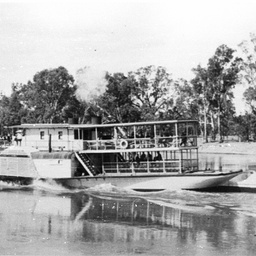 The 'Avoca' at Mildura used as a local cruise vessel. 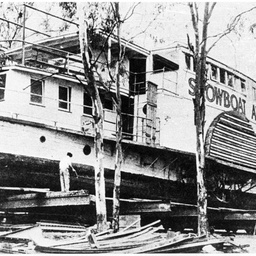 Showboat 'Avoca' arriving at Morgan. 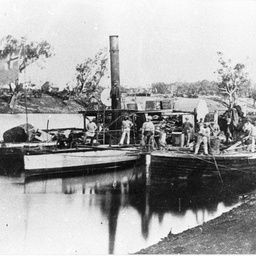 Messrs. Collins delivering her to Murray Bridge. 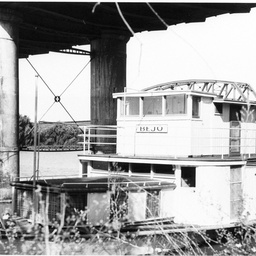 The 'Avoca' passing under railway bridge, Murray Bridge. 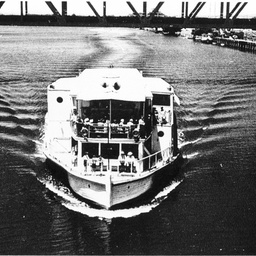 Showboat 'Avoca' on Mildura slip, 1964. 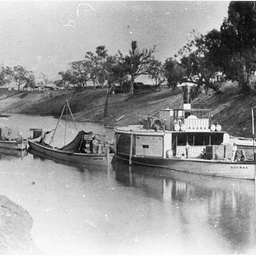 The 'Bantam' on the far right, with 'Paragon' barge, at Echuca Wharf,. 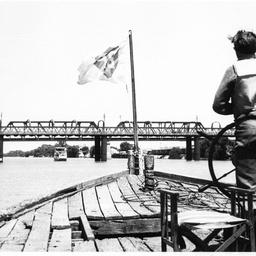 The 'Barge 29'approaching Murray Bridge with helmsman standing at wheel and flag flying. 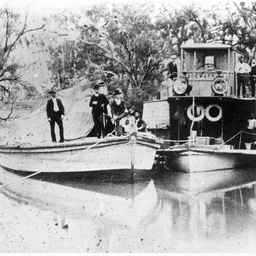 [Comment from F. Tucker: 'This has got to be the "D26" barge which Alan Moritz purchased at about this time at Echuca and brought back to Murray Bridge using an outboard as propulsion']. 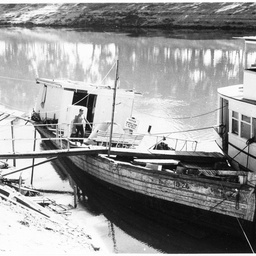 Barge 'D26' looking derelict and part-submerged, supporting a passenger ramp and service pole, with unidentified river boat. 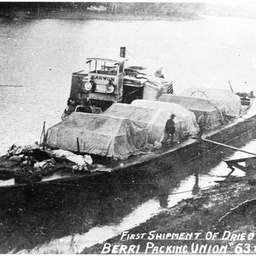 The 'Barwon' with its first shipment of 63 tons of dried fruit from 'Berri Packing Union'. 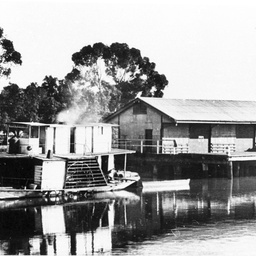 The 'Barwon' and barges. 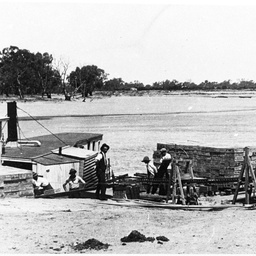 A researcher believes that the bridge in the background is not at Wentworth as first thought but is the Swan Hill bridge. P.S. 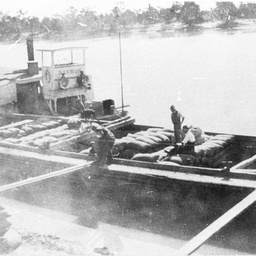 'Barwon' and barge, loading wheat. 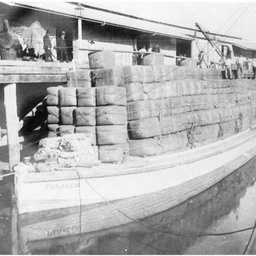 PS 'Barwon' and barge, loading fruit at Renmark. 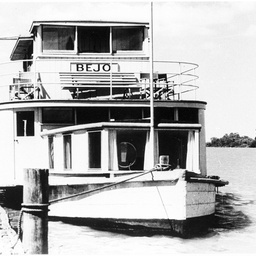 The 'Bejo' formerly 'W.F.B. ', formerly 'Eric'. 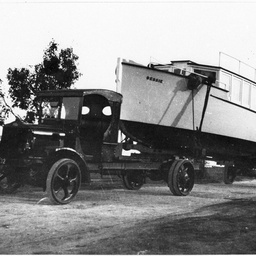 The 'Bessie', small motor launch, being towed by truck and trailer. 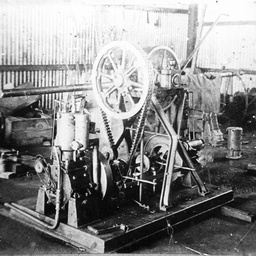 PS Beta's engines removed to workshop floor. 'M.V. Betsy' from an unsourced newspaper. Side view of the 'P.S. 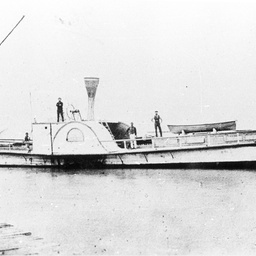 Blanche' with crew posed for photograph. 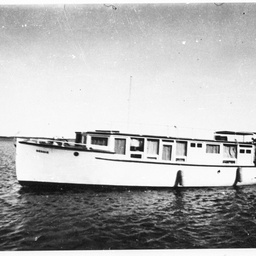 Side view of 'P.S. 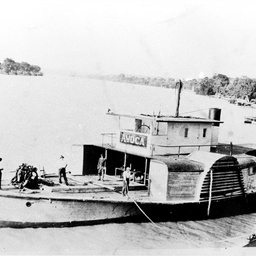 Blanche' loading or unloading cargo. 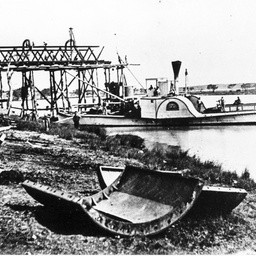 The paddlesteamer 'Blanche' at Edwards Crossing (Murray Bridge) with the construction of the bridge over the Murray River just starting. The 'P.S. 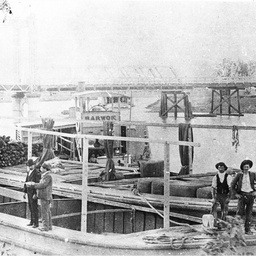 Bogan' with barges and large group of crew on river bank. The 'P.S. 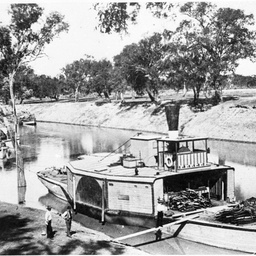 Bourke' with 'Empress' barge on the River Darling. The 'P.S. Bourke' with 'P.S. 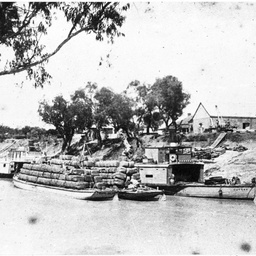 Kennedy' and barges on the River Darling. The 'P.S. Bourke' with 'P.S. 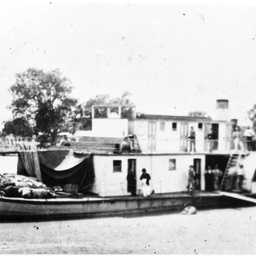 Jane Eliza' at Wilcannia. The 'P.S. 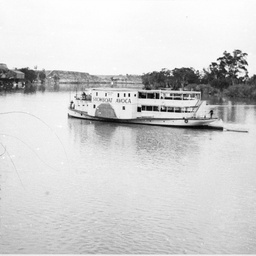 Bourke' with 'Elite', 'Empress' and 'Namoi' barges on the River Darling. The 'P.S. 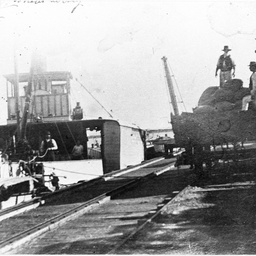 Bourke' unloading at Goolwa wharf. The 'P.S. 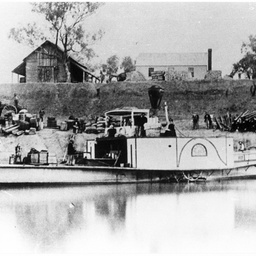 Brewarrina' on the River Darling with barge. The 'P.S. 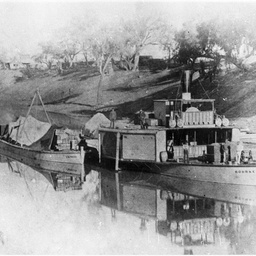 Brewarrina' at Swan Hill wharf.